Option A - Count Me IN! I'm serious about getting in fantastic shape NOW! Rather than just get "Animal Workouts" for $24.95 I'd rather get the whole enchilada for $44.95 now and save some money! Option B - Sounds like a great deal but I'm going to pass. 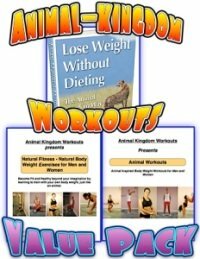 The "Animal Workouts" Book for $24.95 is all I want at the moment. Thanks anyway! 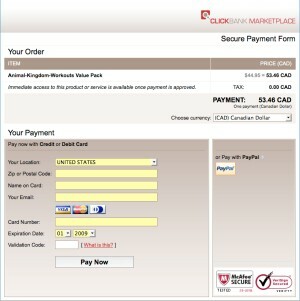 NOTE: Whichever option you choosefor your security you will be taken to a secure order form at ClickBank.com. The order form will look something like this when you click on either "Order Now" button.